This curatorial essay is the documentation from Gretchen Bennett's solo exhibition at Bridge Productions, The Rough Draft of Everything. In this series of new large-scale and fragment drawings, Bennett holds a steady gaze on quiet intimacy as seen through the lens of her daily life. In holding this gaze, she strives to capture light at a particular angle or a specific instance; the way one holds their breath in a moment of great significance. 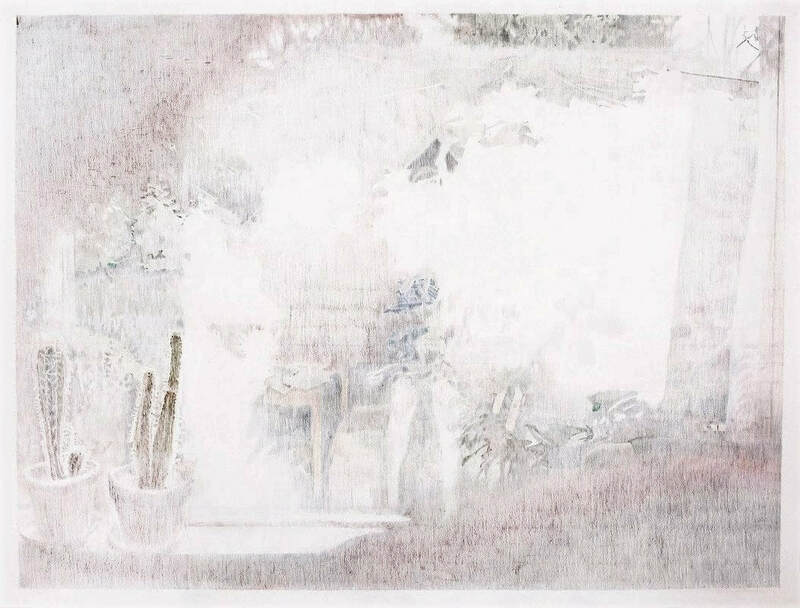 Detailing these freeze-frames in her characteristically ghost-like pencil washes, Bennett reminds us of the potential for deep meaning in each fleeting moment. Gretchen Bennett is well-known for capturing subjects steeped in the cultural mythology of the Pacific Northwest, such as her series of drawings inspired by Gus Van Sants’ film Last Days; or a series of 23 drawings depicting the back of Sarah Linden’s head, each a sequential frame from The Killing (made for a Bridge Productions curated box set in 2012). In each of these bodies of work, Gretchen is not documenting the specific subject as much as she is capturing light. 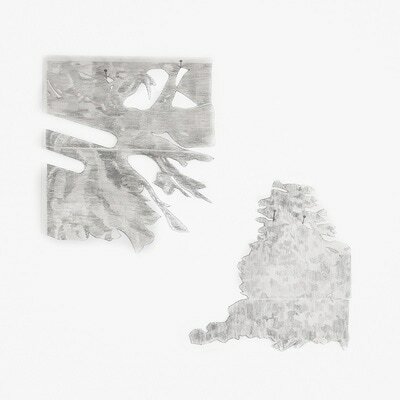 In doing so, her attentive capture also suspends or elongates a moment; in these cases, the cultural moment as well as a literal one.The treatment of converting film, a light-based medium, to mark-making is noteworthy— the history of drawing as an exercise in observation is the underpinning of this work. Unlike a multitude of other artistic references to the Pacific Northwest, Bennett’s interest is not in the dark, mystical underbelly of ceaseless twilight, sheets of rain, and dark skies. Contrastly, Bennett’s palette is ethereal, bright, and overexposed. The subject is nearly impossible to discern in a sea of white paper and pale rainbow colors. The washed-out figures both provoke a feeling of intimacy by making us look closer, and avoid it by not revealing the detail. We’re left with the ghost, an imprint, a retinal burn of something we know we must feel close to, but which is already gone.The imprint occurs because we’ve looked so directly, and in doing so, allowed ourselves a moment of great vulnerability. In a 2008 interview with former Seattle gallerist Billy Howard, he cites tenderness in Bennett’s work. Gretchen Bennett has since been named in City Arts Magazine as one of the many progenitors of a tenderness movement — such a thing being defined by its persistence in locating oneself expressly in specific moments of absolute humanity. Tenderness, in this case, could easily be the way Gretchen expresses the act of looking as manifest vulnerability, deftly engaging us to be in the moment with her. For instance in closely observing her large drawing, Fenestra, a portrait of the artist emerges. She appears in the biography of the objects in the room, which we discover is the artist’s home: plants, a window ledge, a table, a chair; but also in the revelation of the artist’s legs as she stands in her living room photographing the window. Suddenly we are more than observers. In making this glimpse matter by taking the time, we’ve located ourselves in the drawing with her, standing next to her facing the window, viewing her viewing herself and as a result, locating her, too. The drawing is evidence of her presence. In a poetically self-reflecting loop of recursion, The Rough Draft of Everything creates a mirroring between Bennett’s previous work and the new, in which the drawings both reference and describe themselves. Fenestra embodies this kind of feedback loop where Gretchen has, in a sense, redrawn Blue Like Nevermind (Last Days); a 2008 piece from her Last Days series. Similar elements from this previous drawing occur in Fenestra, as if Blue Like Nevermind was a sketch or rough draft for this new narrative. What reappears is a familiar treatment of the subject, the position of an interior view of the outside, a figure with its legs forming a triangle and facing the light. And of course, the angle of the light as it hits us. Only this time the figure is Gretchen herself, facing us bathed in a prismatic burst through an east-facing window; filled with the signature cast of morning light. The Rough Draft of Everything also features smaller instances, drawings, and collections of stencils derived from various components of Fenestra. These fragments represent the ephemera of moments, those fleeting bits of memory we attempt to keep in our recollection of significant events. She gathers them together in clusters, defying the strict categorization of formal aesthetics and arrangement; and in doing so the treatment becomes both irreverent and ceremonial. Bennett’s work in capturing, replicating, and elevating these bits and pieces to have meaning as objects creates a circumstance of renewal, and release. In reviving their repetitious forms as drawings themselves, she lets go of the moment and of the compulsion to keep them exclusively within her memory, to embed them indelibly in ours.